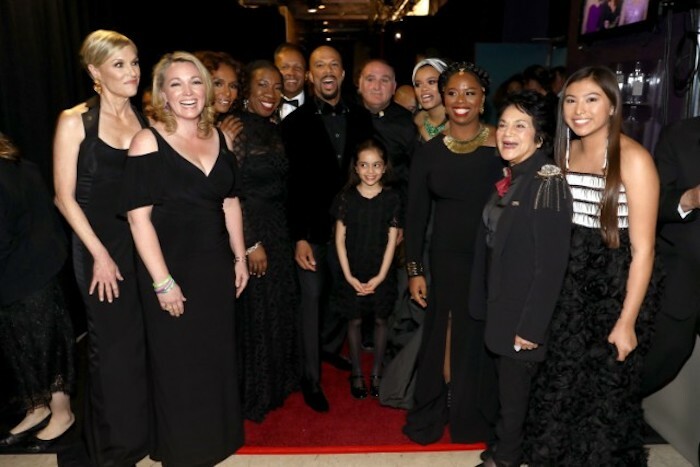 Much like many nominees and winners at the annual Academy Awards, rapper Common and singer Andra Day used the live televised broadcast as an opportunity to shed light on important issues through a song performances. At the 2018 Oscars, the duo did just that and spotlighted 10 unsung heroes and activists of today who have made a difference in society and beyond. Andra and Common shared their thoughts on their decision to celebrate those in the trenches of activism and politics, fighting to make a difference in the lives of others. “If it’s one thing I learned from being a part of Selma it is that an activist is someone who lives their life for what they believe in and works for that cause every day. The activists we asked to join us on stage are people who have dedicated their lives to making the world better,” the actor continued. To keep the focus on the honored and “unsung heroes,” here is a list of who they are as well as what they stand for. Scroll down and get familiar. Mini Bio: Alice Otter, 14, has been a powerful voice of the Standing Rock youth spearheading the #NoDAPL movement. In the summer of 2016, at age 12, she ran 1,519 miles from Standing Rock Sioux Reservation in North Dakota to the front steps of the Army Corp of Engineers office in Washington, D.C., to protest the construction of the Dakota Access Pipeline. Alice strives to remain a positive role model for Native youth through several youth organizations like Woihanble (Dream) and the Standing Rock Youth Council. She is dedicated to keeping the Lakota language and culture alive by living Lakota values and teachings. Mini Bio: Bryan Stevenson, 58, is the director of the Equal Justice Initiative and the author of Just Mercy. Mr. Stevenson and EJI have won relief for scores of people who were wrongly convicted or unfairly sentenced. EJI is committed to ending mass incarceration and excessive punishment in the United States, to challenging racial and economic injustice, and to protecting basic human rights for the most vulnerable people in American society. On April 26, 2018 EJI will open the National Memorial for Peace and Justice and The Legacy Museum: From Enslavement to Mass Incarceration. Mini Bio: Cecile Richards, 60, has been a lifelong activist for women’s rights and social justice, including more than a decade as president of Planned Parenthood Federation of America and Planned Parenthood Action Fund. She is standing up for the right of every woman – regardless of race, income, sexual orientation, or immigration status – to get the health care she needs, including reproductive health care; access affordable childcare and paid family leave; earn a living wage; live and work without facing harassment or abuse; raise families in safe communities with excellent public schools; make her voice heard in the voting booth; and more. Mini Bio: Dolores Huerta, 87, is the president and founder of the Dolores Huerta Foundation (DHF) since 2003 and co-founded the United Farm Workers of America with Cesar Chavez in 1962. DHF is connecting groundbreaking community-based organizing to state and national movements to register and educate voters; advocate for education reform; bring about infrastructure improvements in low-income communities; advocate for greater equality for the LGBT community; and create strong leadership development. She has received numerous awards: among them The Eleanor Roosevelt Humans Rights Award in l998 and The Presidential Medal of Freedom in 2012. DOLORES, the acclaimed documentary about the life and work of Dolores Huerta, premieres on INDEPENDENT LENS on PBS March 27th. Mini Bio: Janet Mock is the NY Times bestselling author of two memoirs, Redefining Realness and Surpassing Certainty, which broke ground by centering her journey as a young trans woman. Mock spoke at the Women’s March on Washington and founded #GirlsLikeUs, a project that empowers trans women. Mock has been named one of Variety’s “Power of Women,” included on Ebony’s Power 100 List, honored at the 2017 Literary Awards by the PEN Center USA, and called one of “12 new faces of black leadership” in TIME, and is currently making TV history as the first trans woman of color to write & produce for television with Ryan Murphy’s FX series Pose. Mini Bio: José Andrés, 48, is named one of Time’s “100 Most Influential People”, “Outstanding Chef” and “Humanitarian of the Year” by the James Beard Foundation. He is an internationally-recognized culinary innovator, author, educator, television personality, humanitarian and chef/owner of ThinkFoodGroup. As a naturalized citizen, originally from Spain, he’s been a tireless advocate for immigration reform as well. Together with World Central Kitchen and #ChefsforPuertoRico, Andrés served over 3.3 million meals in Puerto Rico following the devastation of Hurricane Maria in 2017, reaching communities in need across all 78 municipalities through 23 kitchens. Andrés’ work has earned numerous awards including the 2015 National Humanities Medal, one of 12 distinguished recipients of the award from the National Endowment for the Humanities. Mini Bio: Nicole Hockley, mother of Dylan Hockley who was tragically killed in the Sandy Hook Shooting, is the Founder and Managing Director for Sandy Hook Promise (SHP)- the national non-profit organization founded and led by several family members who lost loved ones at Sandy Hook Elementary School in 2012. Hockley has worked to enable social change and promote gun violence prevention. She has lead SHP to educate and train over 3 million youths, teens, and adults in all 50 states through the organization’s four proven “Know the Signs” programs. Hockley was named one of PEOPLE’s 25 Women Changing the World by PEOPLE Magazine in 2016, received The Common Good American Spirit Award for Citizen Activism in 2013 and most recently nominated for the 2018 People’s Choice Award for Change Makers, by the Child Mind Institute. Mini Bio: Patrisse Cullors, 34, is an artist, organizer, and freedom fighter from Los Angeles, CA and co-founder of the Black Lives Matter Global Network. She is a New York Times Best Selling Author, popular public speaker, and Fulbright scholar. The Black Lives Matter Global Network is a member-led global network of nearly 40 chapters in the US, Canada, and the United Kingdom, and has received prestigious awards including the Sydney Peace Prize. Since its inception in 2013, the BLM Global Network has changed the global conversation around racial justice, gender justice and economic justice. As a part of the Movement for Black Lives, the Black Lives Matter Global Network and its members organize and build local power to intervene in violence inflicted on Black communities by the state and vigilantes. Mini Bio: Tarana Burke, 45, is an American civil rights activist who works at the intersection of racial justice and sexual violence. Fueled by commitments to interrupt sexual violence and other systemic inequalities disproportionately impacting marginalized people, particularly black women and girls, Burke has created and led various campaigns focused on increasing access to resources and support for impacted communities. She is the founder of the “Me Too” movement, which raises awareness of sexual violence, predominantly young women of color from low wealth communities, find pathways to healing. Watch all the activists in Andra Day and Common’s Oscars performance of “Stand Up For Something” from Marshall here.